Looking at that list and bearing in international duty you really see how light we are at 10 for the level of club we are, one injury away from trouble in my eyes for the really big games. If Sexton stays fit for the big UN's great if not we are in a potentially messy situation. Without wishing to revisit the whole Carbery thing it is now that reality bites. Ciarán Ó Raghallaigh reporting this. I don’t see an issue with that personally. We already know he had a year left in contract so that’s no surprise. Upgraded contract was agreed verbally but not signed, he asked Schmidt for advice off his own back, Schmidt advised him that he needed game time (which is right from an Irish prerogative) so he decided to go to Munster. We should let this go. The deal is done, move on. wixfjord wrote: I don’t see an issue with that personally. I also don't think this adds anything new, other than reflecting worse on the player himself. The main problems remain: (a) Carbery moved to another province while still under contract, thereby breaking one of the IRFU's 'rules' (was Leinster even financially compensated for breach of contract? ), and (b) the Irish coach played an important causal role in the decision to break these rules. Moving on from this specific case is one thing - Carbery is gone and happy to be shovelling turnips, so that's that. I personally felt all along that it was a mistake not to play him more at 10, and Leinster must accept some responsibility. However, ensuring it doesn't create a precedent should also be important. We can't allow this to be the new rule: Leinster invests in and develops players, signs contracts with them, only for the contracts to be broken at the whim of the national side. As such, I don't think Leinster should let this go. Of course, what makes it more galling is that the IRFU's rules and conventions are generally broken and bent only to suit Munster. Does it reflect badly on Carbery? Choosing to move to further his career and get more game time? I'd say it's the professional thing to do for him. I don't think they're 'problems' either. As I've said before, we have to start understanding that we as Leinster are merely a branch of the IRFU. We're a feeder for the national side. Schmidt and Nucifora hold most of the power. Joey asked him for advice and he gave the right advice for Ireland. That is and will likely always be the way. Matt O'Connor found this out the hard way. It would be completely counterproductive for Leinster to 'pursue' this, certainly not in public and in any case there's nothing we can do anyway. I'd expect Leo to be savvy enough to understand that. The player moved for more gametime and it should benefit the national side. That's it really. There's no point banging on about it. Is it any different to Robbie Henshaw coming here? Carbery was contracted to play for leinster this season. Until the IRFU decided in April/May he was needed in elsewhere instead and that contract suddenly didn't really mean much anymore. Henshaw was out of contract with Connacht and signed with Leinster. So the situations are very different. Grand so. Apologies for my prolonging the "banging on about it" I'll stop. Or it will just keep going. wixfjord wrote: The player moved for more gametime and it should benefit the national side. That's it really. There's no point banging on about it. johng wrote: Grand so. Apologies for my prolonging the "banging on about it" I'll stop. Or it will just keep going. you asked was it different, it was. Leinster got screwed, simple as. I don't think he was very professional in his dealings with Leinster at all. I'm sure it was a very difficult decision to make. The only thing Leinster can do is to continue to drive for success and make him regret moving, and hopefully down the line he will come back. The big picture in this is that when the world cup comes around, we will be in the position of having experienced cover at 9 & 10. We went to the 2015 world cup with Madigan having relatively little game time at 10, and also acting as cover for 9. The IRFU put plans in place which were unpopular, like Pienaar leaving, but ultimately all the IRFU care about is success for the Irish team. 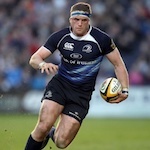 Joey may have feared being left out of the Irish squad if Byrne continued to get the 10 berth at Leinster. We may not like it but his decision is understandable. I don't think there is anything new there only they left out the bit that Ulster was dangled to Joey before any of that (if my memory is not failing me?). So while it might have been Joey who reached out to Schmidt for advice about Munster it certainly was to my recollection Nucifora or someone else (easier to just blame Nuci ) who went to UCD and threw his weight around prior to any talk of Munster happening? Maybe I have that wrong? It was the morning of the Scarlets semi it all came out in the paper if I remember. Anyway all old news now, whatever way they are trying to spin it.